It has been about twenty years since MacArthur wrote Charismatic Chaos. 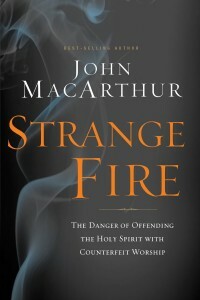 Strange Fire is more than just an update of the older treatise on Charismatics, it is an up-to-date and urgent plea for rejecting their false doctrine of ongoing revelation and renewal of miraculous gifts. Regardless of what one may like or dislike about MacArthur, on this subject he makes a valuable and current contribution to the subject of Biblical gifts and the abuse of that doctrine in our day. MacArthur starts off by rehearsing the beginning of the Pentecostal/Charismatic history throughout the twentieth century—a good reminder for any who have forgotten. Then he exposes the false doctrines such as the New Apostolic Reformation (the so-called “Second Apostolic Age”) led by Peter Wagner claiming to be the first of the reinstitution of the gift of apostleship. He even presided over the newly formed International Coalition of Apostles in 2000. Next MacArthur exposes the supposed gift of prophecy which was made popular by Oral Roberts but continues today with false prophets such as Benny Hinn, Rick Joyner of the Kansas City Prophets, and links such people historically to William Miller, Ellen G. White, Joseph Smith, and the Watchtower Society. MacArthur moves from there to a good chapter on tongues, showing the nonsensical abuse of the gift today and why historically it ceased in the first century (one caveat is that he does not take “that which is perfect” to be Scripture, but “the believer’s entrance into the Lord’s presence”). This is followed by a chapter on healing, especially focusing on Benny Hinn because he is the most visible “healer” today. The last section of the book is MacArthur’s explanation of the true doctrine of the Holy Spirit, covering salvation, sanctification, and the Holy Spirit in the doctrine of Scripture. The last chapter is titled, “An Open Letter To My Continuationist Friends.” Here MacArthur addresses other conservative evangelicals (Wayne Grudem, John Piper) who normally reject charismatic doctrine but happen to hold that some things may be operative today, such as prophecy, healing, or other ongoing revelation. MacArthur does a good job of dealing fairly and kindly with good men with whom he disagrees, showing that they are inconsistent in this area and open to contradiction in their doctrine. This chapter on Cessationism is much needed in evangelical circles today. An appendix is added which contains 19 “Voices from Church History” who believed in cessationism including Augustine, Luther, Calvin, Owen, Matthew Henry, Jonathan Edwards, John Gill, Charles Spurgeon, B.B. Warfield, and others.